Road are clearly out of fashion in urban planning circles. Conventional wisdom now decries roads in favor of public transit, walking or biking in developments designed to mimic traditional 19th century urbanism. Common refrains are “we can't build our way out of congestion” or “widening roads to cure congestion is like loosening your belt to cure obesity.” Also frequently noted is the vehicle miles traveled has – at least until recently – outpaced population growth. But this piece of conventional wisdom is also deeply flawed. It obscures the bigger point that in a growing country we need to expand infrastructure to keep pace. The recent 2010 Census results put this in stark relief. The rate of growth from 2000 to 2010 slowed considerably from the previous decade, but still at a robust 9.7%, or 27.3 million new Americans. It would have been physically impossible to house all those people in traditional urban communities well-served by transit. The 27.3 million number is more than the combined 2009 population of the cities of New York, Los Angeles, Chicago, Philadelphia, Washington, Boston, San Francisco, Portland, and Seattle. In fact, this national growth is greater than the combined population of the 12 largest municipalities in the country. That's just one decade's worth of growth. America's traditional urban areas couldn't contain this, even if they were emptied of all their current residents. And the United States is projected to add an additional 90 million people by 2050. Where are all those people going to go? And how would they get to work even if they could live in these cities, given that much of America's job growth has been suburban? Keep in mind also that much of this urban and transit infrastructure must be seen as more legacy than a reflection of modern choices. It was largely compete 50 or more years ago. Only Portland and Washington, DC have really managed to build new transit friendly urban core cities in the modern era. And despite their growing populations, these two places can only absorb a relatively small amount of new population every year. In Washington, it’s less population growth than gentrification – the replacement of largely poor African Americans with more affluent whites – that is the most outstanding demographic trend. That's not to say America can't invest more in transit or build more transit friendly cities. It can and it should. In particular, large, already dense urban areas like New York, Chicago, and Washington with large core area employment require major investment to upgrade their systems. Even smaller cities need better transit options and more urban neighborhoods. They are simply not well positioned to compete head on with newer suburban areas built from the ground up to support an auto-oriented lifestyle. But this will be difficult since they will have to build transit largely from scratch, and given anticipated cutbacks in new federal transit funding. this suggests they would be well-advised to avoid costly boondoggle mega-projects in favor of unglamorous but basic activities like running a quality urban bus system. But even if we achieve our potential in transit, America still needs to build more roads. We've got an interstate system originally designed for a 1960 population of 180 million and we are now well over 300 million and going up. 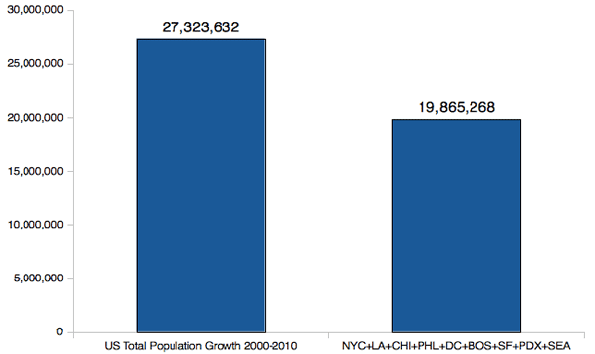 By 2050 we'll have more than double the 1960 population. This will require a major expansion of infrastructure, and that includes highway infrastructure. 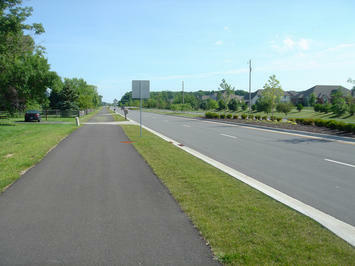 Just as one example, consider a moderate growth area like the Indianapolis-Carmel MSA. Its interstate system was mostly designed and completed circa 1970. The region had a population of a bit over 1.1 million then. Today it is over 1.7 million, an increase of 52%, or 596,000 people. A county the size of that increase would be the second largest county in the state of Indiana, well exceeding that of today’s #2, Lake County, a heavily urbanized county in Northwest Indiana. Yet until recently there had been almost no expansion of the Indianapolis freeway system. Fortunately, it was over-designed when built, but that is no longer the case. Thanks to a fortuitous lease of the Indiana Toll Road however, over 50 miles of freeway in the region are now being widened. Without this, the region would have faced decades of commuting misery. Unfortunately, that’s the bind where most cities now find themselves: managing growth with funding for roadway expansion and even maintenance running dry nationally. Keep in mind that tomorrow's roads need not resemble yesterday's monstrosities. The days of simplistically adding lanes while neglecting basics like enclosed drainage, sidewalks and paths, bus shelters, and aesthetics are likely over in many parts of the country. We need to provide room for the traffic we need to accommodate without excessive over-designs for a 15 minute peak of the peak, or dehumanizing roadway design approaches. Reform of our civil engineering educational system is eminently doable as plenty of great examples of suburban roadway design already exist. Federal standards need a revamp as well. We need to build not just more, but also better roads. With a botched stimulus, huge deficits at the federal and state level, and a public that has decisively turned against those deficits, a major construction program seems unlikely at this time. But in a couple years the economy should be back and a plan for fiscal recovery put in place and under execution. If not, we'll have much bigger problems than roads. But assuming we get past this moment, we need to be laying the groundwork for a major continuation of the long history of American investment in infrastructure, from the Erie Canal to the interstate highway system. This includes not only a significant boost in urban transit spending where appropriate, but also a major program of both roadway repair and quality expansion, particularly in our growing metro regions. And as the Indiana example of a Toll Road lease shows, this doesn't all have to come from tax dollars. Without this investment, our critical transport networks will ultimately seize up and America cannot hope to be competitive globally over the long haul. Photo of a suburban road in Carmel, IN by author. Submitted by reshhia on Fri, 08/30/2013 - 09:46. My answer is this – you’re evaluating your work already. Every day you’re thinking ‘Did that go well?’ ‘Could I improve this?’ ‘Why did I say that, he must think I’m a right writing research papers’ The reason to use evaluation tools and approaches is that they make this reflection process visible, more in depth, and translate it into a language so that people can understand, even if they don’t know anything about your area of work. Submitted by zion1122 on Tue, 08/20/2013 - 06:43. Submitted by linksmega on Mon, 07/29/2013 - 03:55. Submitted by khuramsony34 on Wed, 06/19/2013 - 01:27. Submitted by fendacais on Mon, 06/10/2013 - 02:47. Submitted by khuramsony34 on Sat, 06/08/2013 - 11:16. Submitted by Design New Haven on Thu, 01/13/2011 - 11:27. Thank you for pointing out that our infrastructure policy needs to require "complete streets" that meet the needs of all segments of society, needs to invest in fixing existing systems before building new capacity, and needs to be tied to a strong framework of sustainable economic development. However, new roads must also be built with the goal of equitably distributing our nation's resources among our nation's people. Infrastructure choices have an impact on the lives of real people, not just economic growth numbers on a spreadsheet. Social inequity creates massive inefficiencies in the economy and ultimately results in sluggish growth and higher costs for all. Though you cite the example of gentrification in some parts of Washington, Washington is in reality a much larger city than the core area. Most of Washington's (and other cities) urban areas are not gentrifying -- rather, they consist of moderate density, older neighborhoods that do not have even remotely adequate infrastructure to meet the basic demands of families within them. These "plain vanilla" urban areas are losing investment to new exurban areas that have all the advantages of money and capital -- advantages that are overwhelmingly fed by the new highways that you advocate for, including the ones along the Indiana Toll Road. This is not just unsustainable and a waste of our resources, it is also unfair to the people on the losing end -- increasingly even moreso as 90% of our nation's wealth becomes concentrated in the hands of the top 1%. Instead of letting our urban areas and urban populations continue to decline in favor of wealthier areas and populations on the fringe, just to promote "growth" on paper, we need to reinvest in the human, social and real capital already located within existing urban areas. "Reducing traffic congestion" should be a lower priority than building schools or ensuring people are able to put food on their table - many currently can not. Creating a sustainable economy can be done directly through infrastructure, but really needs to be combined with urban policy measures such as progressive taxation, tax incentives for existing buildings, redevelopment fees and energy taxes that accurately account for the true long-term costs of sprawl, etc. The "growth" and new roads we are seeing might look great on paper and to politicians, but without taking these measures, all of our progress is just being built on the backs of someone else. Those folks on the exurbs of Las Vegas or Detroit who have lost 80% of their home values won't ever be rescued by new roads - they'll be rescued if Las Vegas's and Detroit's older, moderate density, existing neighborhoods (especially the ones with huge income disparities and failing schools) can be transformed back into wonderful places to live, where families can succeed regardless of who they are or where they were born, not areas within which the majority of people who grow up in poverty will also live in poverty as adults. In a global economy where inefficiency and social inequity are major disadvantages, this is a metaphor for the situation our entire country faces. Submitted by Aaron M. Renn on Fri, 01/07/2011 - 14:26. The vast bulk of the suburban areas in these cities are entirely auto-dependent, perhaps with some limited exceptions for commuting to the CBD. It clearly does nothing for the cause of urbanity and transit to have more people living in exurban Chicago, for example. From the standpoint of roads versus transit, city population may not be ideal, but it is certainly better than comparing MSAs. Submitted by anelka on Thu, 08/22/2013 - 22:07. Interesting insight. Now build more roads and prove all the naysayers wrong. Screw the debt. Chiacgo taxpayers have, and will continue to, supplement growth with their tax dollars. Submitted by Booerns on Thu, 01/06/2011 - 21:42. "The 27.3 million number is more than the combined 2009 population of the cities of New York, Los Angeles, Chicago, Philadelphia, Washington, Boston, San Francisco, Portland, and Seattle." Just as one example, consider a moderate growth area like the Indianapolis-Carmel MSA.. Fortunately, it was over-designed when built"
Exactly. It was over-designed when built, maybe not everywhere, but certainly in many places. Is the system as built in 1960 such a God-given right, and necessity, that it needs to be scaled up with population growth in perpetuity? Will enough ever be enough?